A few months ago a festive red and white holiday envelope arrived in our mailbox. The glittering address label was adorned with holly, and the stamp displayed a cheerful snowy scene. It had all the makings of a festive Christmas moment… but it was September! “Supposedly empty equipment?” Really? This card was postmarked December 2015. Not only did the postal service badly miss the opportunity to deliver a timely message, but they made what sounds like a pretty lame excuse. And apparently this scenario happens so often that they have a rubber stamp for it! These excuses are somewhat justifiable. 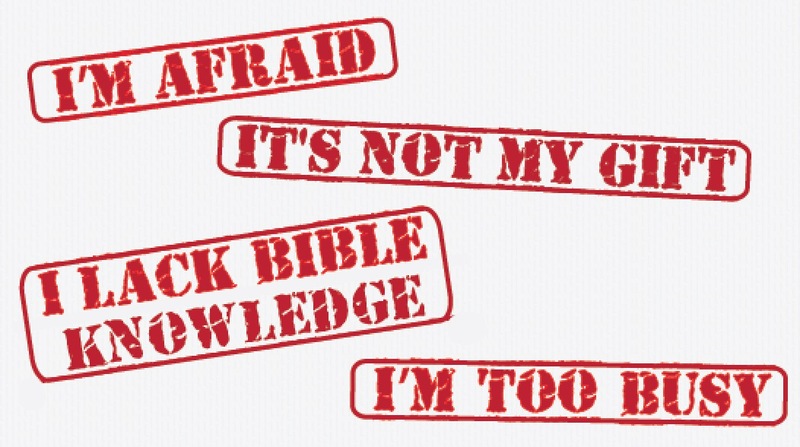 Yes, evangelism can be scary! And yes, some people are more gifted in this area, some have more Bible knowledge, and others have more time. But nowhere in the Bible do we read that sharing our faith with others is optional. Jesus said, “Go into all the world and preach the Good News to everyone.” (Mark 16:15) But how often are we actually doing that? Let’s be creative in sharing the Good News. When we think of evangelism, the first things that come to mind might be nervous and awkward confrontations with icy unbelievers. But it doesn’t have to be like that. We can use our creativity to help others see Jesus in unique and meaningful ways. 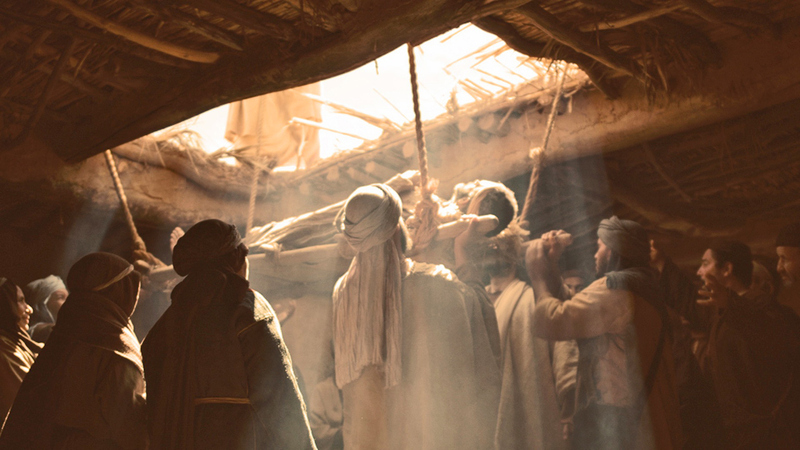 A well-known story in Mark 2:1-12 tells us about a man who desperately needed Jesus. He was paralyzed and unable to come to the Lord on his own, so four men carried him to a house where they knew Jesus was teaching. When they found there was no way to get through to the Lord at the overcrowded home, they came up with a unique idea. They lowered the paralyzed man through an opening in the roof so he could personally experience Jesus and His healing power. Now that's creative! This was definitely not the usual way to bring someone to the Lord! "Creative evangelism" is certainly a lesson we can learn from this story. These men didn’t quit. They didn’t conclude that the timing wasn’t right. They could have made excuses and gone home, but instead they thought “outside the box.” Just imagine how different that paralyzed man’s life would have been if they had given up! How often do we spend time coming up with imaginative and personalized ways to bring our “sin-paralyzed” friends to Christ? Have we been creative in thinking of ways to start appealing conversations with certain unbelievers, or how we can casually steer our words towards the spiritual side? And do we often consider the dire consequences our unsaved friends will face if we give up on them? We can even passively instigate conversations without any pressure at all. For example, a friend of mine makes a habit of carefully printing a cross on every golf ball he uses. Why? Because his golf partners can’t help but see the cross at some point during a round – and they’re the ones who end up asking about it! Of course we know that we can’t rely on our own eloquence and wisdom (see 1 Corinthians 2:1 and 4). But we can recognize that Jesus Himself was creative in His approach to people and in His ways of drawing them to faith and trust in Him. Use Christmas as an opportunity to share your faith. 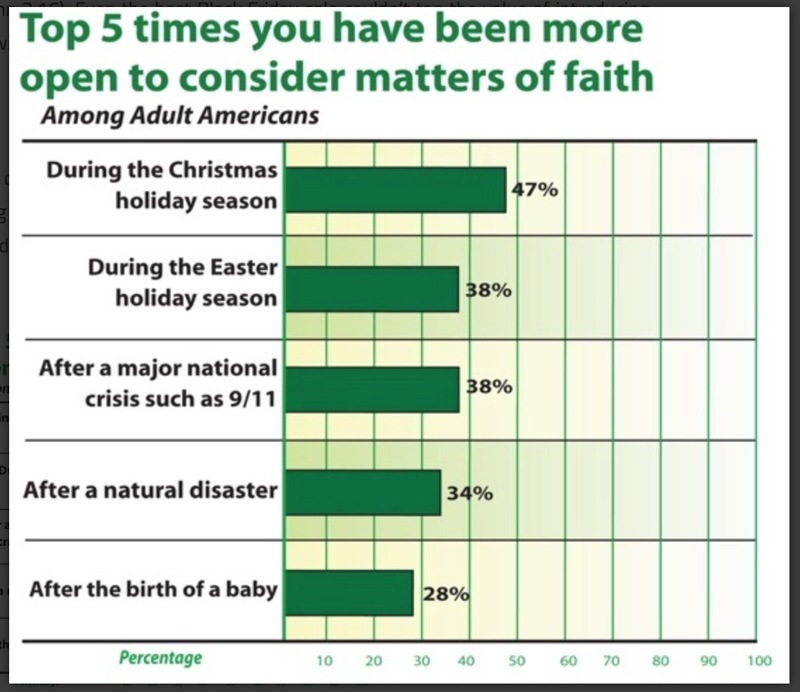 A recent poll of 15,000 Americans by Lifeway Research revealed that a higher percentage of people are open to hearing about Jesus during the Christmas season. It makes sense, right? Stories and songs featuring the birth of Christ are commonplace in December. Many unbelievers even routinely attend some kind of religious service during the Christmas season. Others become particularly reflective about where they're headed in the New Year and may be open to “turning over a new leaf” by attending church or a Bible Study in 2017. With that in mind, let’s not use our usual rubber stamp excuses or miss an opportunity to deliver a timely message about Jesus this year. Let’s use the natural spirit of the season to our advantage and be creative in sharing our faith with others. Social Media: Are We Changing Our Standards?